Diana Porsche and Di Sandro. Photos: ©SusanJStickle. Wellington, FL – March 19, 2017 – Week ten of the 2017 Adequan® Global Dressage Festival (AGDF) in Wellington, FL concluded on Sunday, March 19 with the final competition day of the Florida International Youth Dressage Championships (FIYDC) at Equestrian Village at the Palm Beach International Equestrian Center (PBIEC) in Wellington, FL. The 2017 Florida International Youth Dressage Championships, presented by Sarah Davis, Terri Kane, Kim Van Kampen, The Van Kampen Boyer Molinari Foundation, Hampton Green Farm, and Dressage4kids, took place over the duration of week 10 at the AGDF. 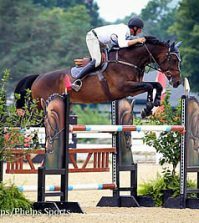 The week featured competition for riders in the Under 25, Young Rider, Junior, and Pony divisions, offering them a chance to compete on a larger scale. 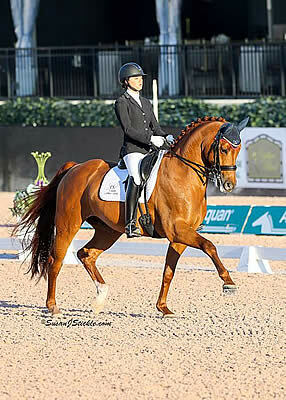 Young riders wishing to compete at the international level are provided with an opportunity to showcase their talent at one of the largest dressage competitions in the world. Within the FEI divisions offered to riders competing in this season’s FIYDC, there were five horse and rider pairs in the FEI U-25 division, 15 entries in the FEI Young Rider division, eight riders in the FEI Junior Rider division, and a rider in the FEI Pony Rider division. This year, youth riders represented seven countries, including Austria, Canada, Germany, Great Britain, Spain, Trinidad and Tobago, and the United States. The overall scores were computed as Team Test 40%, Individual Test 40% and Freestyle 20%. Awards were presented to the top eight riders in each division, and prizes included a trophy donated by Kim Van Kampen, prize money donated by Dressage4kids, Sarah Davis, and Terri Kane, and the personal use of a stall at Hampton Green Farm for the 2018 season, donated by Kim Van Kampen, for each of the four overall division winners. This year, the FIYDC also worked in partnership with JustWorld International, and winners chose JustWorld Programs to ride for, that will then receive a percentage of added prize money. 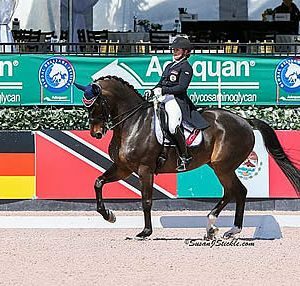 Ranked as the Number One rider on the FEI Youth Dressage World Ranking List- U25, 21-year-old Diana Porsche (AUT) and her own Di Sandro, a 2008 Oldenburg gelding (De Niro x Gentina x Sandro), rounded out the weekend with an Under 25 Division win, sponsored by Diamante Farms. 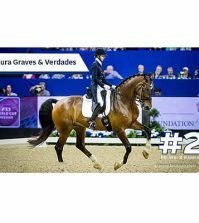 The combination scored a 70.711% in the FEI Intermediaire II 16- 25 CDI U25, a 71.860% in the FEI Intermediaire I 16- 25 CDI U25, and a 73.875% in the FEI Grand Prix Freestyle 16-25 CDI U25. Seventeen-year-old Vanessa Creech-Terauds (CAN) and Fleur de Lis L, a 2009 Hanoverian mare (First Dance x EM De La Rosa x De Niro) owned by Louise Leatherdale, bested the FEI Young Rider Division, sponsored by Yeguada de Ymas. 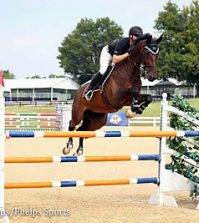 The duo scored a 70.500% in the FEI Young Rider Team Test CDI Y, a 69.167% in the FEI Young Rider Individual Test CDI Y, and a 74.725% in the FEI Young Rider Freestyle CDI Y. The FEI Junior Rider Division, presented by The Axel Johnson Group, was won by 18-year-old Jade Ellery (GBR) and Porsche’s Eloy, a 2004 Hanoverian gelding (Earl x Wadina) owned by Diana Porsche. The pair scored a 69.595% in the FEI Junior Rider Team CDI J, a 69.386% in the FEI Junior Rider Individual CDI J, and rounded out their weekend with a 73.375% in the FEI Junior Rider Freestyle CDI J. This is Ellery’s first year competing internationally and her first season in Wellington. 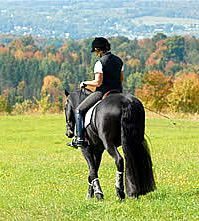 Fifteen-year-old Lisa Widmayer (GER) and Paso Double, a NRPS mare (Bodo x Iris x Inselfurst) owned by Katja Widmayer, captured victory in the FEI Pony Rider Division, scoring 66.513% in the FEI Pony Team Test CDI P, a 65.650% in the FEI Pony Individual Team Test CDI P, and a 68.275% in the FEI Pony Rider Freestyle CDI P.
For their victory, Widmayer and Paso Double were presented with the Poldy 10 Memorial Trophy. 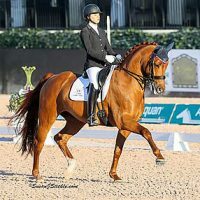 This was the fifth year that the Florida International Youth Dressage Championships were hosted by AGDF, and the competition is organized by Equestrian Sport Productions. For more information and a full list of results, please visit www.globaldressagefestival.com.